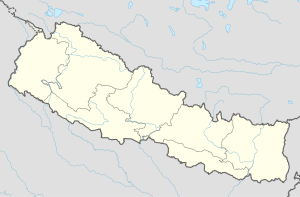 Dullu (Nepali: दुल्लु) is an urban Municipality in Dailekh District of Karnali Pradesh in Nepal. The Municipality was formed merging 6 former Village Development Committee i.e. Naule Katuwal, Nepa, Paduka, Dullu, Pusakot Chiudi and Badalamji since 18 May 2014. Fulfilling the requirement of the new constitution of Nepal in 2015, all old municipalities (58 municipalities) and villages (more than 3900) were restructured into 753 new Municipalities and Villages, thus Malika, Gauri, Kalbhairab and Gamaudi villages Incorporated with former Dullu municipality. This place was the winter capital of the kingdom of Sinja and later it became independent until being converted into a subnational kingdom up to 2019 BS when it was annexed into Nepal by King Mahendra. There is a stone tabloid which is supposed to be the first one written in Nepali language . ^ "संक्षिप्त परिचय". www.dullumun.gov.np. Retrieved 17 July 2018. ^ "स्थानीय तहहरुको विवरण" [Details of local level body]. www.mofald.gov.np/en (in Nepali). Ministry of Federal Affairs and Local Development. Retrieved 7 July 2018. This Bheri Zone location article is a stub. You can help Wikipedia by expanding it.